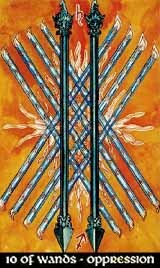 The Ten of Wands are standing for suppression and restriction, showing the Fire on the grounds of the Earth, where they cause an uncontrolled, destructive burning. Fire is not made to rest on the grounds, having lost the contact to the higher levels of spirit, it mutates to a blind and cruel force , not understanding the own self anymore. Fire is a power that has to be handled with imagination and reflection, not with stubborness and hardened standards. To understand the card, you have to understand the qualities of the Wands which stand for Chiah, the general living spark, the vitality of soul. You cannot force it down, a free bird cannot survive in a cage.